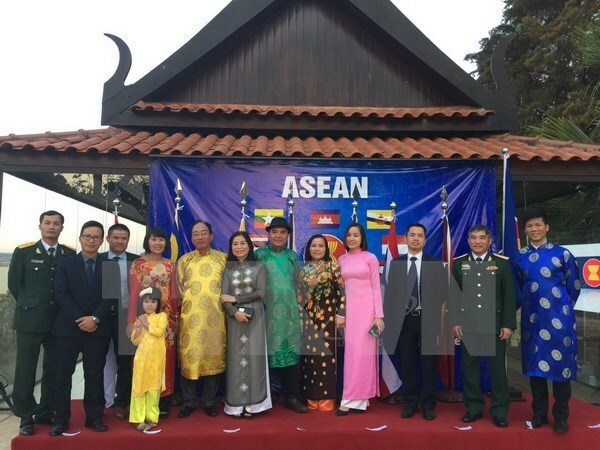 Hanoi (VNA) – The ASEAN Committee in Brasilia (ACB) held a banquet for about 200 guests on August 30 in celebration of the bloc’s 50th founding anniversary. The ACB consists of representatives of seven ASEAN member countries in the federal capital of Brazil, namely the Philippines, Indonesia, Malaysia, Myanmar, Singapore, Thailand, and Vietnam. Speaking at the event, Thai Ambassador to Brazil Surasak Suparat, who is the current ACB Chairman, stressed the growth of ASEAN in security, international and regional economic integration, and social-cultural development over the past five decades. He said he believes that the efforts to build an ASEAN Economic Community and strengthen cooperation among bloc members and between ASEAN and partners across the world will contribute to the global prosperity and security in the coming years. Brazilian Secretary General of Foreign Affairs Marcos Galvao congratulated ASEAN on its 50-year achievements and believed in the group’s further development and contributions to the global trade and peace. The diplomat said through the upcoming visits by Foreign Minister Aloysio Nunes to Singapore, Malaysia and Vietnam, Brazil wants to work with ASEAN member states to bolster cooperation in all fields.